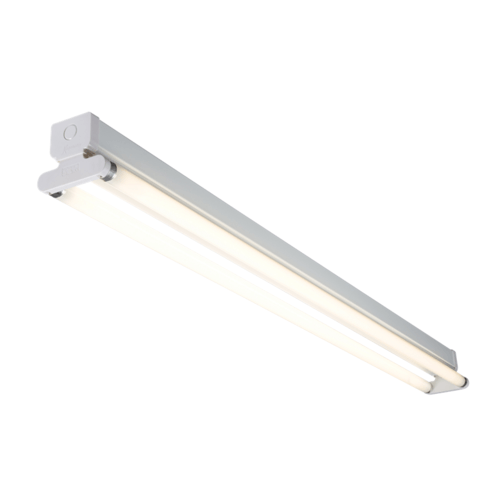 The Twin 58W high-frequency T8 fluorescent fitting from KnightsBridge is the ideal replacement for older fittings in your home, office, shed, or anywhere fluorescent lights can be used. The high frequency technology used in this fitting is known to be up to 10% more energy efficient than a standard fluorescent fitting, and features none of irritating hums or flickering found in older models. The high frequency fluorescent fitting also requires no warm up time, giving you full output light in seconds instead of minutes. This 5 Ft fitting houses a twin 58W T8 tube bulb. We recommend you always measure the fitting before purchasing a replacement bulb to make sure the bulb is correct. All our fluorescent bulbs have exact measurements listed in the description for this purpose & your convenience. Is the cable entry central?